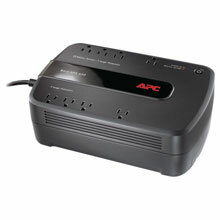 APC Power Protection products are designed to protect your computer, data, and on a larger scale, your company. An Back-UPS Series instantly switches your computer to emergency battery backup power and allows you to work through brief power outages or to shut down your system in the event of an extended outage. High-performance surge suppression protects your computer from electrical noise and damaging power surges - even lightning. The APC BE650G1 is also known as American Power Conversion	APC-BE650G1	.